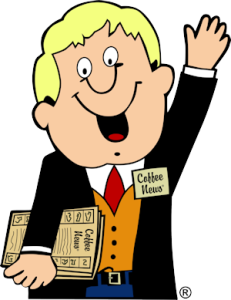 Enter to win our “Find Little Coffee News Guy” Contest! Where is the Coffee News® Guy this week? Enter to win surprise gifts! Each week, we hide a tiny image of the “Little Guy” in one of our advertiser’s ads. Readers must search through all the ads and locate him. Pick up a copy of the Coffee News® to search for Little Coffee News Guy Contest and submit your entry below for your chance to win this month!